Islamic prayers at Jerusalem's holiest site ended peacefully on Friday, a week after clashes between Palestinians and Israeli police. About 3,000 police were deployed around the Old City of East Jerusalem, and men under 50 were barred from entering the Temple Mount, or Haram al-Sharif. 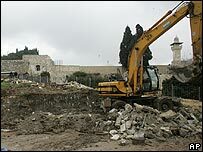 Palestinians oppose Israeli excavations at the site, the holiest in Judaism and Islam's third holiest shrine. Muslims say the work threatens holy remains, a charge Israel denies. Israel says the work is needed to repair a walkway up to the compound. But Palestinian leaders see the work as a huge provocation. The start of the work last week sparked angry protests and Muslim leaders around the world have demanded it be halted. Plans for construction work for the walkway have been put off, but preparatory excavations continue. Jerusalem's Palestinian mufti and officials from Israel's Islamic movement had called for a mass protest ahead of this Friday's prayers. But the leader of the Islamic movement, Sheikh Raed Salah, remains banned from the site after being arrested during earlier protests. Israel imposed strict limits on who could enter the compound, with many left praying on the streets outside the Old City, says the BBC's Bethany Bell, in Jerusalem. Police remained deployed after prayers came to an end as thousands of worshippers began streaming out of the compound, seen as a possible flashpoint. On Thursday, Turkey agreed to send an observation team to assess Israel's approach to the excavation work, and Israel has installed web cameras to broadcast the dig online. The Haram al-Sharif is believed to be where the Prophet Muhammad made an ascent to heaven into the presence of God. Jews believe the Temple Mount is where Abraham offered his son Isaac as a sacrifice to God. It is also the site to the First and Second Temples. The Western Wall of the mount is the holiest site in Judaism. Israel captured East Jerusalem in the 1967 war. Since then, the compound has remained under Muslim jurisdiction in conjunction with neighbouring Jordan.